This week marks Donald Trump’s second anniversary as president of the United States. The past two years have brought their share of controversies, including the special counsel investigation on Russian interference, the negotiations toward a new free-trade agreement in North America and the Republican party losing its majority in the House of Representatives, following a severe setback in last November’s mid-term ballot. Research Co.had the opportunity to ask Americans about their current head of state this month, as well as to review two topics that have dominated talk around the District of Columbia for the past few weeks: border security and the partial government shutdown. Across the United States, 38% of Americans approve of Trump’s performance as president while a majority (58%) disapprove. 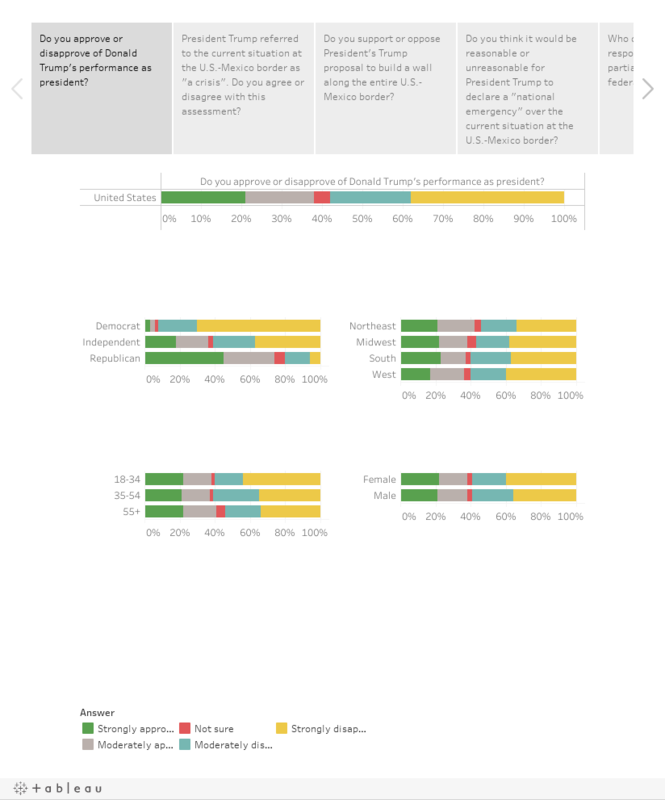 Among self-described Republicans, Trump’s numbers climb to a more-than-respectable 64%, with just one in five (20%) disapproving of the way he has handled his duties. It is not a surprise to see that only 6% of Americans who identify with the Democratic party believe Trump has done a good job as president, but independents – who were not entirely enamoured by Hillary Clinton’s campaign in 2016 – are starting to become more critical of Trump. In this demographic, the president’s approval rating stands at 36% and disapproval reaches 61%. When asked about their views on Trump’s proposal to build a wall along the entire U.S.--Mexico border, 55% of Americans disagree with the president and 40% agree with him. The political polarization of the country is unmistakable in this question: only 7% of Democrats side with Trump compared with 76% of Republicans. Trump had also suggested that he might declare a “national emergency” over the current situation at the southern border. Almost three in five Americans (59%) believe this course of action would “definitely” or “probably” be unreasonable. But among Republicans, the proportion drops to a paltry 20%. There is much to ponder when analyzing the findings of this survey of Americans. For any other White House dweller seeking re-election, an approval rating lower than 40% after two years in office would amount to a disastrous showing. But Trump is clearly counting on the unambiguous fervour that his base continues to bestow upon him, regardless of his actions, comments or tweets. The Republican base is decidedly in favour of the way Trump is doing his job, and their perceptions of the president do not waver hugely from issue to issue. More than seven in 10 Republicans approve of Trump’s performance, agree with his assessment that the situation on the southern border is a crisis, want to build the wall and think it would be justified for the president to invoke a national emergency if he wants to. Whoever becomes the Democratic nominee in 2020 will have a difficult time trying to move these diehard Republican supporters away from Trump. Independents are a different breed: they have fluctuated wildly in the past as presidential campaigns have progressed. In 2012, Mitt Romneyovertook Barack Obamafor a brief period as the first choice for registered independents in a tracking survey I conducted for a now defunct company. Obama ultimately rekindled with these voters and earned a second term in office.